(MoneyWatch) What is the most expensive home in America worth? A whopping $190 million -- far and away the most expensive piece of real estate put on the open market in recent history. Dubbed, quite innocuously, Copper Beech Farms, this Greenwich, Conn., property blew the last most expensive home out of the water when it was listed in May. Its predecessor in the top ranking was the Crespi Hicks Estate in Dallas, listed at $135 million, which went up for sale in January and held the most expensive title for a brief three months. There are a few others that top $100 million, at which point most list prices drop off to a meager $75 million. Some of those aren't even homes in the sense of a standalone structure and property that surrounds it -- they're posh Manhattan apartments. Here's a roundup of the most expensive homes in the country available for purchase -- that is, if you have millions and millions to spend. An 1,800-foot driveway winds through the woods to this massive home, which has 12 bedrooms and nine bathrooms. There's even a wing for staff and and a kitchen for all the people you'll hire to keep this place humming and maintain the grounds. You're not just paying for the house; you're paying for the property. There's a 75-foot-long heated pool, spa, grass tennis court, stone carriage house, clock tower, cottage and greenhouses. And did we mention the mile of shoreline and two islands? This is apparently the most expensive New York City apartment available on the market, at $125 million, and it may also be one of the largest. The penthouse encompasses the 41st, 42nd and 43rd floors of The Pierre Hotel. With 360-degree views, there's no part of Manhattan you can't see. There are four adjoining terraces, five master bedrooms, nine bathrooms, five working fireplaces, separate guest suites and room for staff. The place even comes with two staff members who provide maid service. The home at Big Homer's Pond isn't terribly impressive. It's got four bedrooms and six bathrooms spread out over 5,600 square feet. It has a guest house, too, and a pool, but nothing too flashy. What $118 million will bring is complete seclusion. Located in Martha's Vineyard, the home sits on 314 acres of oceanfront property with a 35-acre freshwater pond and more than 1,200 feet of private beach on the Atlantic. It butts up against a 632-acre wildlife refuge, further separating you from the rest of mankind. The Legendary Beverly House was the real-life basis for Xanadu, the massive home in Orson Welles' "Citizen Kane." Originally built for publishing magnate William Randolph Hearst, whose character in the film, Charles Foster Kane, was played by Welles himself, the home has since hosted John and Jackie Kennedy during their honeymoon and provided settings for both "The Godfather" and "The Bodyguard." The $115 million estate sits atop a hill three blocks from Sunset Boulevard in Beverly Hills and can be accessed only by one of the city's longest private drives. Beverly House has elaborate architectural details such as balconies, carved ceilings, paneled walls, hand-carved woodwork and fireplaces, waterfalls that flow into the pool, Venetian columns and floor-to-ceiling bookshelves in the library. It has a gym, spa, massage room, double master suites, formal dining room, breakfast room, an art deco nightclub and media center. There's an outdoor terrace that can accommodate up to 400 people for sit-down dining, lighting for tennis courts that come with an indoor bar, an eight-car garage and a guest house. And we're only getting started. This $100 million estate, located south of San Francisco in Hillsborough, is one of the few in the area with as many as 47 acres. The 16,000-square-foot home on the property actually has is own name, the Bills and Faville mansion. It has a grand ballroom, living room, library and pavilion, which all open to a pool courtyard. Formal gardens and park-like grounds surround the home, but the rest of the land is undeveloped, which allows for privacy and maintains security. The estate has been owned by the same family for 150 years, and they keep it in immaculate condition. This $100 million penthouse has been on and off the market recently. Its owner, Steven Klar, has put it back on the block and claims it's "the highest terraced residence in the United States" on his website. Perched very high over Manhattan, it stretches from the 73rd to the 75th floor of the CitySpire building and overlooks Central Park and all the city's landmarks. There is also a guest apartment on the 72nd floor. CitySpire amenities include an indoor pool, health club and valet parking. Though it encompasses nearly four full floors, the apartment measures only about 8,000 square feet, still enough for six bedrooms, nine bathrooms, a private elevator, wine cellar, eat-in kitchen, dining room and media room. If you're not afraid of heights, you can take in an additional 3,000 square feet of exterior space out on the balconies. The view alone justifies the $75 million price tag on this Snowmass, Colo., estate. This massive 18,000-square-foot home is nestled in the Rocky Mountains, just outside of Aspen. The 876-acre property includes 15 miles of trails for hiking or riding ATVs or horses. There are three ponds complete with waterfalls, two -- yes, two -- outdoor kitchens with fireplaces, fire pits and a brick pizza oven. To top it all off, there's a furnished teepee with gas heat. The home features seven bedrooms, 11 bathrooms, an indoor/outdoor pool, a movie theater, a gaming room with a bar and a glass elevator. With apartments like this this one, which will run you $95 million, you're really paying for location, location, location. It is located on the 18th floor of a posh hotel on New York City's Fifth Avenue -- an expensive spot in an expensive city. The 15-room residence covers an entire floor of the Sherry-Netherland building, and has terraces on nearly every side, and overlooks Central Park, midtown Manhattan and the Upper East Side. It has seven bedrooms, eight full bathrooms, an eat-in kitchen and a formal dining room. Known as Tranquility, this $75 million home on Lake Tahoe is unique. Situated in a pine and aspen forest, the 210-acre property boasts a 27,000-square-foot mansion with a private lake and boathouse, two par 3 golf holes with water barriers, horse stables, an artist's studio and guest and staff residences. The home has an indoor pool featuring glass mosaics, a theater room -- not a movie theater room, but a room with a real stage -- a massive library, game room and bar, as well as nine bedrooms, 14 bathrooms and a garage that comfortably fits 10 cars. 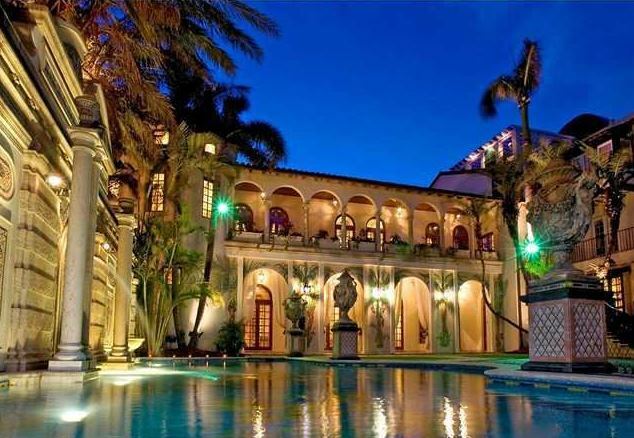 Casa Casuarina, better known as the Versace Mansion, was last listed for $75 million -- though it's unlikely the Miami Beach home will sell at that price. It will hit the auction block Sept. 17, and bidding will start at $25 million -- $100 million less than its original listing for last June. The mansion exudes the taste and style of the late Gianna Versace, who was shot and killed on its steps in 1997, and still retains much of the original furniture and décor. The 23,000-square-foot home features an immaculately tiled terrace and pool, an impressive courtyard, a rooftop lounge, 10 bedrooms and 11 bathrooms.